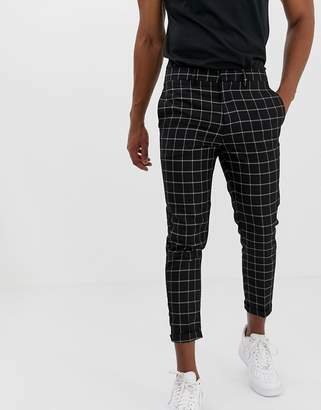 Trousers by New Look, It's hip to be square, Zip fly with hook-and-bar closure, Button fastening, Stretch waist to back, Belt loops, Side pockets and two back pockets, Back pockets may be tacked, Cropped leg, Slim fit, A narrow cut that sits close to the body. New Look joins the ASOS round up of great British high street brands, showcasing the best in upcoming style and staying ahead of the game. From graphic print T-shirts, through to footwear and accessories, New Look's menswear collection takes influences from classic rebel movies and the best of effortless style.